The new Bavaria Nautitech 46 Fly does not take its name from an ability to become airborne, but is the flybridge version of the original 46 Open. The flybridge opens a spacious area for skipper and passengers, provides excellent visibility in all directions and consolidates control lines neatly in one place. The hull and deck are constructed of a vacuum-bagged, resin-infused fiberglass laminate, a proven modern technique popular among boatbuilders. The core is Divinycell. Poking about into lockers and hatches revealed neat, careful workmanship. Not only is the structural layup nice, but the plumbing and wiring are appropriately sized and well installed. The engine rooms call for some comments. These spaces in the aft end of the hulls are quite large and easy to get into. However, the diesels themselves are farther forward than I like to see, and getting around them could be a bit tight, especially if a generator or watermaker is blocking the way. Unlike other Bavarias, the Nautitech catamarans come from a factory in Rochefort, France, a town on the River Charente with centuries of shipbuilding history. The rig is fairly conventional for a contemporary catamaran, with a square-top mainsail, a self-tacking working jib and a gennaker on the bowsprit. Various other headsail combinations are possible, of course, and the builder offers an optional 63ft mast to make the boat ICW friendly. 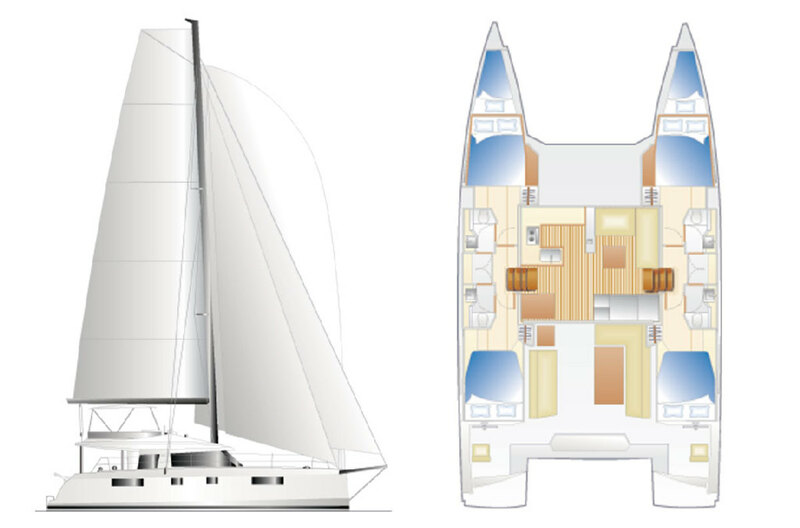 Going with the trend in cruising cats today, the plan of the Nautitech 46 Fly is all about entertaining. From the sun lounge on the bow trampolines to the bright, open saloon to the big cockpit astern, traffic flow for a multitude will be easy. There’s also a more intimate space for conversation on the flybridge, where the backrest of the helm seat pivots when at anchor to provide two additional seats. Beyond that, the flybridge is set up as the control center for the boat, with all the halyards and sheets leading to three electric winches close to the wheel. Visibility is nearly perfect from here, although furling the mainsail could be a challenge due to the fact that the boom is far enough above the cabintop that even tall crewmembers must climb some mast steps to push the last bit of the luff into the cover. That said, Bavaria also offers a hard top that will put the entire length of the boom within easy reach thereby solving this problem. I find the rakish profile of the Nautitech 46 Fly quite handsome, and although that will change with a hard top over the flybridge, I think the boat should still look pretty good. The interior is quite lovely, with a light wood laminate joinery set off nicely by high-quality, attractive fabrics. The seats are comfortable, too. Where many boats seem to be designed specifically for tall men, the Nautitech 46 Fly is friendly to short and medium size folks. My wife, who is 5ft 3in, found the seats well proportioned so she was not left with her feet dangling above the floor. She also appreciated the big skylights and their shades, which will control light to any degree you wish. It isn’t obvious, but the undersides of the counters serve as grabrails, a splendid idea. Most of the plentiful lockers and cabinets are within reach of sailors of all sizes, even children. A compact nav station is on the port side of the saloon, and the builder will expand that to hold full-size charts if an owner wishes. You could easily steer from the saloon in inclement weather using a remote for the autopilot. We sailed the four-cabin version of the boat, which has mirror image hulls, each with two nicely sized and well-lit cabins and a shared shower, but separate toilets, between them. The three-cabin version devotes one entire hull to a luxurious owner’s suite. There are also two small cabins in the forepeaks, which can serve either as quarters for a paid crew or as wonderful little nooks for children. We were greeted at the mouth of the Severn River in Annapolis by light, variable winds, generally 5 knots or less. Our test boat was equipped for Caribbean sailing with a small, self-tacking jib and the smallest gennaker on the builder’s sailplan, a serious mismatch for the conditions we actually encountered. To complicate the situation, the light winds were oscillating from 20 to 30 degrees, so measuring accurate tacking angles was impossible. Still, the Nautitech 46 Fly did move. I measured 2.5 knots of boatspeed while sailing to windward with the working jib in 5 knots of wind. Switching to the gennaker added another half knot to the speed when reaching. When the breeze came up briefly to 8 knots, our boatspeed moved right up to 5. We had enough speed to tack without incident, but the slow response made maintaining a straight course more difficult, especially with the fluky conditions. On the delivery from France to England for shipping to America, the crew reported everything from flat calm to strong winds, briefly seeing a peak boat speed of 16 knots. Our test boat had the optional 55hp engines instead of the standard 40hp ones. The cost difference is about $3,000. Feathering props are also an option and should improve the sailing speed a bit in light winds. The Nautitech 46 Fly powered quite well, with 2,300 rpm yielding 8.1 knots of boatspeed and full throttle (2,700 rpm) producing 9 knots, which is the theoretical displacement hull speed for this waterline length. Sound levels in the saloon were low. The electronic throttles are a joy to use. With the saildrive props about 6ft ahead of the rudder, control and response were excellent, and the turning circle is tight: about one boatlength. As we have come to expect with catamarans, turning with differential power to the two engines, the “Kitty Pirouette,” let us spin in our own water. Fitting into a tight space at the dock is no problem with the 46 Fly. The Nautitech 46 Fly should find an enthusiastic audience among sociable sailors who want the comfort and style of a nice seaside apartment along with the ability to handle rough conditions when they occur. It would be a nice platform for cruising the East Coast in summer and going south to the islands when winter comes. 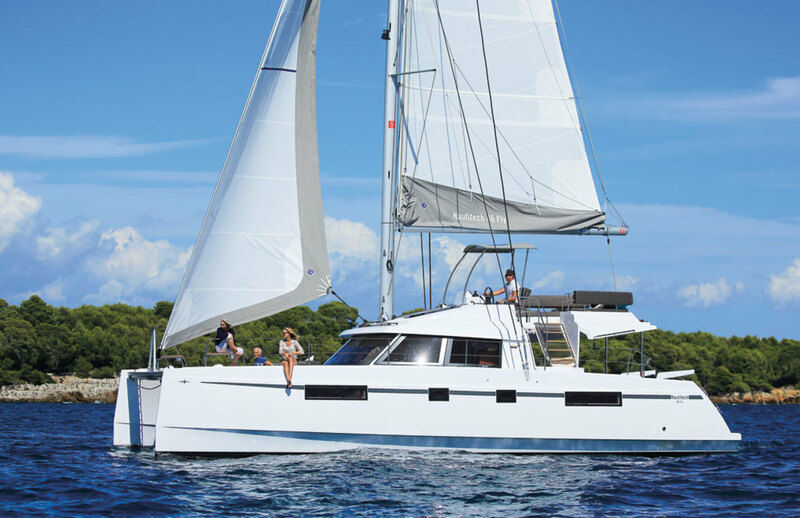 Voyagers may prefer the Nautitech 46 Open, which is essentially the same boat, but with twin helms aft for better weather protection.